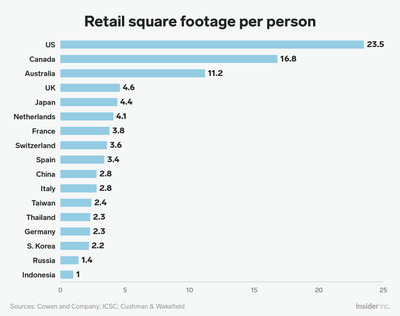 The United States still has far more retail space per capita than any other country. This suggests the US is still in the “early innings” of mass store closings, according to a new 50-page report by Cowen and Company. As more stores close, hundreds of poorly performing shopping malls will go dark. At the same time, sales are accepted to accelerate at the country’s top-rated malls. The American retail industry has been rocked by record-high store closures, dozens of high-profile bankruptcies, and the death of hundreds of shopping malls over the last several years. But the amount of retail space in the US still far outweighs other countries, which suggests that we are only in the “early innings” of mass store closures, according to data compiled by the advisory firm Cowen and Company. 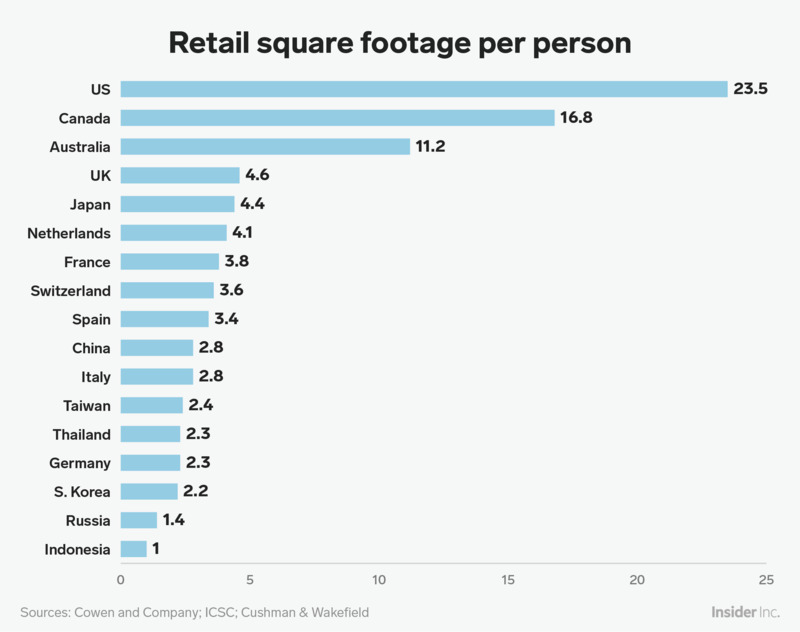 The US has about 23.5 square feet of retail space per capita, compared to 16.8 square feet of retail space per capita in Canada, and 11.2 square feet of retail space per capita in Australia, according to the report. As mass store closings continue, hundreds more malls could go dark. The number of malls in the US is expected to drop from roughly 1,150 today to fewer than 850 within the next several years, the report says, citing the commercial real estate firm Cushman & Wakefield. The closures will hit C- and D-rated malls the hardest. These shopping centres are already battling declining customer traffic, falling occupancy rates, and low sales productivity. But it’s not all doom and gloom in the retail industry. While many failing stores and malls are closing, sales are expected to accelerate at the country’s top-rated malls. “Our take is mall performance bifurcation will accelerate as retailers continue to invest in top malls in the top metro areas at the expense of lower performing malls in secondary and tertiary markets,” Cowen analysts wrote. And while retailers like Sears and Toys R Us have been closing hundreds of stores, dollar stores, Aldi, Lidl, and others are growing.